Although we've talked about TLC's Replica Land Cruiser before, the company's released some new photos, and we're still impressed. You see, some thought the original FJ40 Toyota Land Cruiser had character, simplicity and genuine utility, while others considered it a clear rip-off of Jeep's CJ series. Nonetheless, purists have few options these days, considering most SUVs are mere soccer-ball carriers with few of the rock-climbing capabilities of old. Most wouldn't be caught dead on backcountry switchback in a Hummer H3. 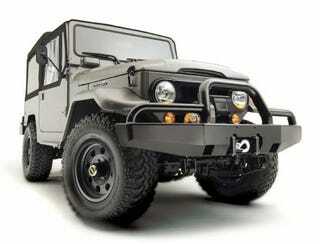 That's why the folks at TLC (no, not the network) created the Icon — a handcrafted remake of the original FJ40. The Icon's got a few things going for it the original never had, but many Cruiserheads considered de rigeur. The engine's a GM Ram Jet 5.7-liter V8 providing 350 hp and 400 ft-lb of torque. Also, check out those custom Westach gauges. Yeah, it's only for show — and starts at $88,000 — but you wouldn't want your off-road beastie looking like someone's baby bus, would you?